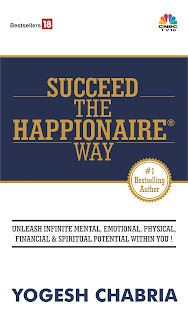 Yogesh Chabria - The Happionaire ​Blog - Best Motivational Speakers In India - Inspiration, Success: The Chameleon Sells His Pounds, Dollars, Euros and Why Bankruptcies Are Good! The Chameleon Sells His Pounds, Dollars, Euros and Why Bankruptcies Are Good! Recently I was speaking to the Chameleon. I’m sure all of you might be remembering him from my earlier posts here. He has sold almost all his Pound, Dollar and Euro holdings. He in fact even sold a couple of investment properties he owned in Central London, besides his stock holdings at the London Stock Exchange. He jokingly told me that when even Standard Chartered is coming to India with an IDR to raise money it speak a lot. Standard Chartered was formed between two banks which were formed in the 1800s. This was the time when Britain was a colonial and imperialist power formed on the philosophy of plundering rich countries like India. Even today they have our jewels and treasures in their museums. It is high time we get them back to India, including the wonderful Kohinoor diamond. I wish our politicians were bolder and spoke and demanded what is and will always be rightfully ours. All his money is now coming to India and I know for certain that wherever his money goes, it almost certainly ends up giving some very good returns. Today only a fool would want to keep his money in any of those currencies. If you do happen to live there, you will keep a small amount for your daily needs, but it would be best convert the rest and invest it wisely. Central Banks all over the world seem to be hell bent on printing more notes and destroying their economies. Once again if you were to just convert your Pounds, Dollars or Euros to Rupees and do nothing else, you would once against lose money. With rapid growth of wealth in India, inflation too is rising. You need to make sure your money is invested in assets that will be desired by millions. Good company stocks are certainly one of them. Gradually more and more pension funds, hedge funds and trusts are sending money into India. The really smart people have already realized that India is going to outperform not just the West, but also China. Investors like the Chameleon send their money wherever their money can grow and multiply. It isn’t emotional or personal. The world power is shifting from the West and this is a reality. One of our Happionaire family members was asking us about Africa, well it makes great sense to invest there - but in terms of capital and general security as well India is a better option. If someone has the time and inclination, there is nothing like starting your own farm - but make sure you are physically present or visit your farm at least once in a week. Best would be to grow basic fruits and vegetables, with rising food inflation you can really benefit. See the prices of just tomatoes -how much they have risen. If they go up from Rs. 20 to Rs. 40, you will have no option but to still buy. Fellow Happionaires have been asking me a lot about Greece, America and the UK and bankruptcies and bailouts. The best thing would be for them to let the country go bankrupt. It doesn’t make sense to keep fueling a system that wastes money. Unfortunately in a bail out the smart, good and honest people suffer. The guys who saved wisely will now have to bear the costs of people who squandered money away. For instance in India, how many people think Air India should be bailed out all the time? Honest people pay taxes, while Air India continues to burn fuel and money of the Indian tax payers. Inefficiency and an inability to compete shouldn’t be rewarded. Capital grows when the efficient are rewarded and the inefficient are allowed to die a natural death. Governments run by politicians and bureaucrats who enjoy wasting public money, shouldn’t be bailed out. They should be punished. I wrote in details about this in Happionaire's Cash The Crash, the same continues to apply, so irrespective of whether it is Greece or Air India, bankruptcies are good. The reason politicians enjoy bail-outs is because they have nothing to lose, it is the innocent tax payer who loses. At the same time, most common people think a bail-out is good and the politician gains popularity. The real world is not a popularity contest or a beauty contest, many times tough decisions need to be taken that will help create a better future. For instance if Long Term Capital Management, the hedge fund, was not bailed out in 1998, almost certainly other financial institutions and hedges funds would be more careful. Ten years later, Lehman Brothers would have not gone bankrupt because they would have gotten their act together. I can guarantee you that once the government sells Air India, it has the capability of once again becoming a great airline. Maybe the TATAs can buy it once again. Let us allow countries to go bankrupt. They will arise out of it stronger and better. Let us allow people to feel a little bit of pain for the mistakes they have made, when a child burns his finger to a hot kettle he becomes more careful with fire. Were he to not experience any pain, he might have risked lives playing with fire. Hi Yogesh, thanks for the nice piece, well timed. Do you think now when nifty PE is about 22 which is more than 1 SD of its long time average, is the time to partially go into cash or gold and wait for some kind of correction and then get into equities fully. In similar line what are your thoughts on FT India dynamic PE fund? Really true Chabriaji. Our politicians are a bunch of hijras who have no guts to demand what is truly ours. Since time of independence they have not been real men. Look how they gave away Pakistan. We need people like NEtaji Subhash Chadra Bose. Glad you spoke about this topic. We need to not only get back our diamonds but also shut down useless companies like Air India. It is the worst airline I have ever flown. It is a shame and sign of the 'political' India. We need to have a leader like you who is young and a bold person. Jai Hind brothers and sisters. Rajan ji you just robbed the words out of my mouth. But do not insult hijras, at least hijras will give you some blessings when you give them money. Throw the politician out and that sector will boom. Throw the politician in the dust bin outside air India and watch it boom. I saw Rajneeti and you can see how these politicians are. Some words I can not want to use in this very respectful and dignified forum. I would suggest skip the FT PE Fund. Better things are avlaible. Just a guess is the Chameleon, Sushil Wadhwani? No comments on politicians since I can't abuse in this public blog site though they should have been. It anyway does not matter for them. I do agree with Sanjay Rajan and RK on their indian political view s.
How can I invest n Srilanka...this a country not many people are talking..about..but I think has a gr8 future..
Is ther any way to invest for indian investors in srilanka? I discovered your blog a month back and this is first time i am posting a comment here. In the meanwhile I have read both of your books and the entire blog including one of your educational research reports just for the sake of learning. What i like the most about your blog/book is that it not just talks about things like stocks and investment it also reflects so many things which we can call in a single word as 'Indian' values. And of course what i like the most about this post is your suggestion for gardening or growing vegetables/fruits etc.. because that's something I do (in a very small way though) and mention about in my organic kitchen gardening blog. Hope to see you keep doing the good work. US and Europeans are buying India with the same worthless printed money. So inshort again we are selling India for worthless paper currency and in the end we again will be slaves to Foreigners, thanks to FDI and FII. Also I think it is high time you disclose more details about this Chameleon for we your followers to make a better guess. Will reply to the other comments shortly, but your blog really was beautiful Raja ji. The pictures of fresh plants and organic life, makes me really want to grow fruits, vegetables and plants. I hope other Happionaires also visit it. It can't be done in the city, so would need to do it on the outskirts. Wondering where and how to start.....any suggestions and ideas? It's almost like a different world out there. Thanks you so much for the individual reply. ".....Best would be to grow basic fruits and vegetables, with rising food inflation you can really benefit. See the prices of just tomatoes -how much they have risen. If they go up from Rs. 20 to Rs. 40, you will have no option but to still buy." I differ with your statement that the grower will be benefited out of inflation. I don't know whether you have direct knowledge about farmers. As mentioned in your example tomatoes, tomato farmers are not getting the right price for their produce. There are instances in AP, where they did not get atleast a single rupee per kg. It is the middlemen that are benefiting in the system. Neither the farmer nor the end users like us are benefited. I have the same doubt as the first comment.Nifty PE is nearly 21 now and is just below the bubble PE of 22. I thought the Indian Market will correct more to abt 14-15k on the sensex but it did not happen at all! Do you think this is right time to enter the Indian mkt? Or wait for more time for some sort of correction like 20? Mr. Rao, but we as educated people can change all of that. If I had a farm, why wouldn't I directly sell to a Reliance Fresh or a super market chain? Or just invest a little more in trucks that will terasnport the vegetables directly to the closest city market. That is where most of the money can be made. Don't you think so? Very gud article. Raja ji you are doing amazing work. if we can grow such organic vegetables in our premises, no one would be interested to have chemical grown vegitables from markets. as you posted in article, Our politicians doing nothing for our country. why dont they promote Solar electricity, subsidize and provide bank loans for promoting solar light. now days even Air conditioners running on solar power. i am planning to write a letter of power ministry related to this matter but i know these politicians wont even bother about such issues. I would have to Second the opinion about MTNL. I agree from fundamental point of view it is/was good. But such considerations could b made when it had monopoly. Now you have to take into account competition as well as the management. Management of MTNL as well its competitors. I had bought a report sometime back. It is excellent from the "When to buy" Perspective. But a little insight on "When to sell" would be better(Based on fundamentals ofcourse), and also how to judge managements. I Don't think every retail investor can go the meet managements every now and then. What is your say about real estate sector. The property prices are rising at jet speed amidst the global financial chaos. Is it the right time to buy the property. No article since a month? Please share your view and on going thought process with us. The outstanding credit of banks, both public and private, to commercial real estate at the end of March 2009 was Rs 91,500 crore against Rs 63,000 crore till March 2008. This was an increase of 45% over the previous year and more than double the amount of Rs 44,000 crore exposure of these banks during boom period of 2007. Speaking on the sidelines of a meeting of heads of Regional Rural Banks with the finance minister in the Capital, banking secretary R Gopalan said NPAs in the restructured loan category of the real estate sector had gone up . He said the government may not go in for any more restructuring of loans as the past concessions were one-time measures and granted to beat the slowdown . The tough stand of the government, if coupled with lending rate hikes by RBI which is to be announced on Tuesday, may make survival of many builders and developers difficult given the fact that they had pumped in hundreds of crores into the sector and were holding on to their stocks for lack of customers. Genuine home buyers please stay away from buying flat/home. The Bankster who is supposed to safeguard our savings/advise us about protecting against inflation is using our own hard earned money to loot us legally with the real estate friends. NPAs in restructured loans to real estate sectors are increasing but for Reserve Bank of India, it is not yet sign of a bubble. It cant see the enough evidence of the price increase so far. Not sure in what world these morons live ? Just two aspects on that — one is that from a monetary perspective, the only way to deal with real estate prices is to reign in liquidity, to raise interest rates, to make borrowings more expensive - in short, make money less attractive. We have started doing that. Now we have broken up the cycle — into half-yearly ones where we take monetary and policy-related actions, and the quarterly cycles where we take only monetary actions. So, the provisioning issue would typically be done in either the April or the October-November policy. Obviously if we feel there is some crisis growing we can act any time. but we assessed the situation and decided that there wasn’t enough evidence of runaway price increases that warranted an out-of-schedule action. Where are you these days??? Well, we all happionaires are missing you!! ab kya agle Independence day ko agla article likhoge ?? ?